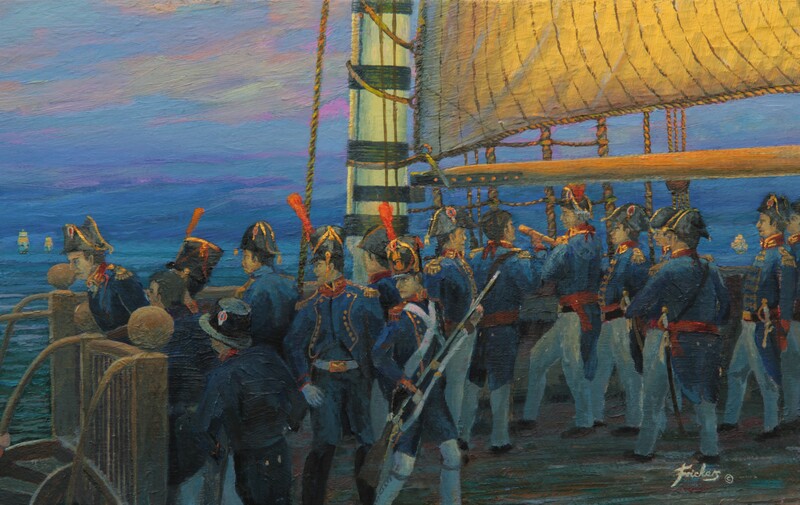 By Gordon Frickers this marine painting measures 30 x 121 cms (12″ x 48″), Oils, price upon application. ex studio ex frame; payments can be arranged by installments. To be faithful to the times and the spirit of Napoleon‘s sailors of whom Napoleon said he had ‘always liked his sailors and thought them very brave men‘. After much travel, reading and research I can only agree completely. Gordon Frickers, that’s me folks, had the unprecedented honour to be ‘Official Artist’ for HMS Victory for 2005, from 1994 to 1998 so had unique access to archives in Great Britain and throughout Europe. The ‘Nelson and Trafalgar’ core collection was the first fruit. Contrary to popular myths, legend and propaganda the French and Spanish were not surprised by Nelson, they fought with remarkable bravery and behaved with great gallantry after. ‘Click’ on an image to see more detail. Available as a beautiful heritage quality marine print, signed and numbered. The British fleet of Lord Nelson as seen at approximately 06.15 Monday 21st October 1805. The exact positions of the British ships has been much debated by scholars and naval officers for over two hundred years. Here, you are one of the first people since eyewitnesses to see quite accurately what the men of the Combined Fleet saw from the French flagship Bucentaure. 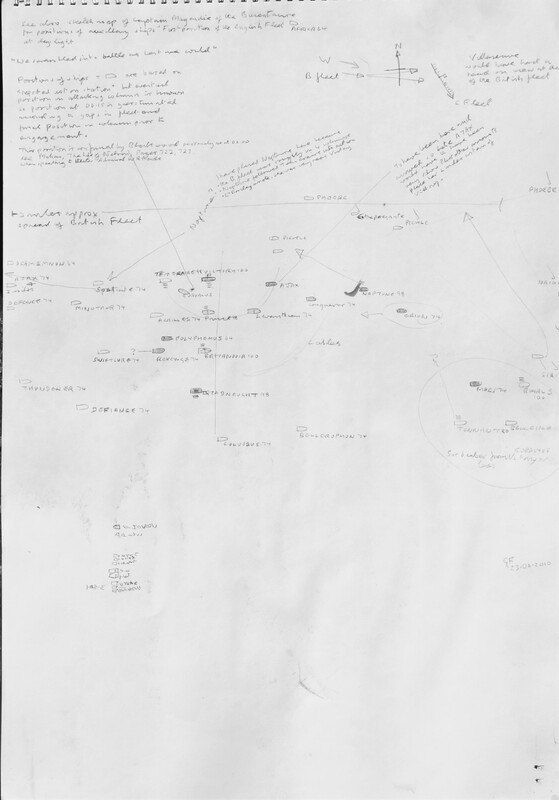 Careful research of the period documents clearly proves the commanders of the Combined Fleet knew of the British presence and Vice Admiral Villeneuve anticipated Nelson’s tactics. The rising sun is highlighting the topsails of the British fleet against the darker western sky. Concept Sketch Trafalgar Dawn French Perspective, price upon application. Some 10 years passed while I was researching for this painting, to make a pair with the now famous “Trafalgar Dawn” the view from HMS Victory. Some of the essential details were reluctant to be found. On the darker horizon a little after the British sighted the Combined Fleet described as “a forest of masts” against the sunrise, the contrary perspective is seen on that fateful dawn. In 1911 the King appointed an Admiralty Committee to reveal what really happened at the battle of Trafalgar. 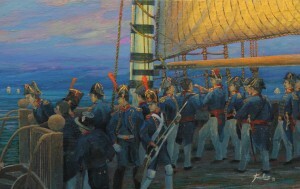 Their report mostly based upon the British ship logs published in 1913 formed the primary source for the layout of this painting. My secondary sources included the diaries, logs and maps drawn by the surviving French and Spanish officers of the Combined Fleet. There were other sources most of which I’ve listed elsewhere. 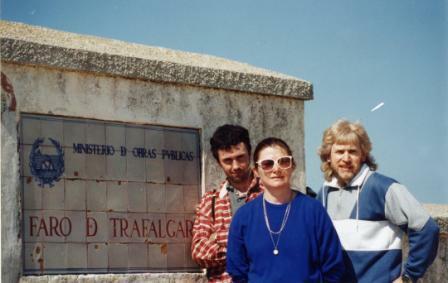 Overall many corrections resulted from my modern research bringing us an exceptional version here of that moment before the momentous event that was the battle of Trafalgar. Meaning the layout of the British fleet shown here results from extensive research and new information discovered so represents the definitive impression.My hunt began in earnest when equipped with a letter of introduction from the then commander of HMS Victory, Mike Cheshire (thank you Mike) I visited and consulted in Britain, France at the Brest archives and naval museum and the Paris archives and naval museum. Followed by in Spain, the Madrid Marine archives and museum, Cadiz University and to San Sebastian Naval Base Museum as a guest of the Spanish Navy. Everywhere I was shown much courtesy and cooperation. Consequently much was revealed that is not normally available to scholars. I still have copies of all the reports and drawings made by surviving senior officers of the Combined Fleet immediately after the battle of Trafalgar. The Combined Fleet was certainly unlucky with the weather, a heavy swell from the west, taken abeam, spoiling their gunnery, and by British standards the fleet was ill equipped, poorly trained. Knowing this the officers of the Combined Fleet never the less choose to fight, many fought most gallantly. Villeneuve’s appearance has been ‘borrowed’ from a contemporary portrait. 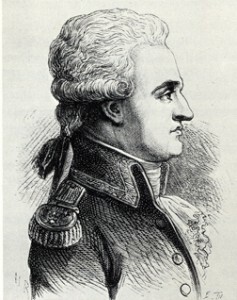 Pierre Charles Jean Baptiste Silvestre de Villeneuve was born into an aristocratic family at Valensoles in Provence in 1763. He joined the French navy at the age of 15. All the uniforms and clothing of the other men were also checked in detail so are reliable as a document. 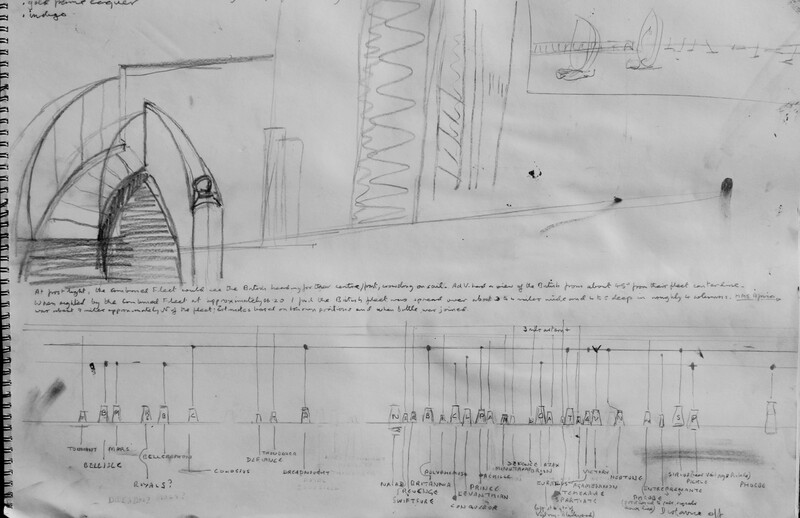 A working ‘Sketch for Trafalgar Dawn’, the French Perspective, price upon application. On the margin of the signed numbered prints I have added a drawing and names each British ship individually. All officers of the Combined Fleet reported that Nelson’s fleet was not in regular order. This picture complements the original Trafalgar Dawn, The view from H.M.S. Victory at 06.05, Monday 21st October 1805. The Combined Fleet could not have been less lucky with the weather, a swell from the west, taken abeam made their ships roll heavily, spoiling their gunnery. Nevertheless, after the battle at Gibraltar, HMS Victory had 600 cannon balls removed from her hull and of course that does not include the many others that hit various parts of ‘Victory‘. I have endeavored to be faithful to the times and the spirit of Napoleon’s sailors of whom Napoleon said he had ‘always liked his sailors and thought them very brave men’. and of course search several sources for ‘British admiral, Lord Nelson’.